November– MOM Center was host for our secondTurkey Trot 1 Mile Fun Run, 5K Run and 10K Run this past November! It was the 8th annual event for the Turkey Trot. May– Local Artists, Gallery 330 and MOM Center have joined together in an event to raise awareness of the presence of violence against women in our community. There will be over 20 Venetian masks hand painted and donated by local artists. These painted Venetian masks tell the stories of local women affected by violence. Masks will hang at Gallery 330 from April 11 through May 4th, followed by a silent auction at a special First Friday Art Walk reception on May 4th at 6 p.m. Proceeds will benefit the MOM Center. Gallery 330 is open Tuesday-Saturday from 10am to 5pm. November – MOM Center was host for our first Turkey Trot 1 Mile Fun Run, 5K Run and 10K Run this past November! It was the 7th annual event for the Turkey Trot. It was a blast and a morning of good family fun. Proceeds benefit the MOM Center. It will always be held the Saturday following Thanksgiving. Early registration will open about a month prior to the event. 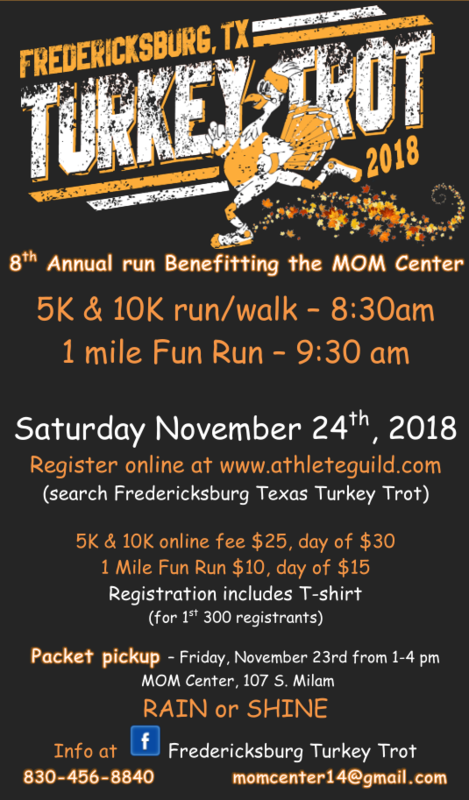 We will also put that up on MOM Center Facebook and Fredericksburg Turkey Trot’s Facebook page, so check for this special event around that time. The Turkey Trot turkey will be out and about, surprising local sponsors, so be ready to have a picture taken with our special gobbler as you make your sponsorship donation! Pictures will be used in some of our advertising for the event! October – Each year since opening, MOM Center has participated in a national event known as National Pregnancy Loss Month. It is held in October and celebrates the life of children lost due to miscarriage, SIDS, abortion, or any other death of a child. This is not a fundraiser. It is an evening of love and support, healing and caring, to let the families of this community know they have support in their grief, and that we all acknowledge that their child existed and was loved and is missed. We will advertise this on our Facebook site and in the Fredericksburg Standard in early October each year. M-Th: 10:00 a.m. – 3:00 p.m.